Commonly known as the "Thud" by its crews, the Republic F-105 Thunderchief was a single-seat supersonic fighter-bomber used by the United States Air Force. As a follow-on to the Mach 1 F-100, the F-105 was also armed with missiles and a cannon; however, its design was tailored to high-speed low-altitude penetration carrying a single nuclear bomb internally. First flown in 1955, the Thunderchief entered service in 1958. As the largest single-engine fighter ever employed by the USAF, the single-seat F-105 would be adapted to deliver a greater iron bomb load than the four-engine ten-man strategic bombers of World War II. The F-105 would be best remembered as the primary strike bomber over North Vietnam in the early stages of the Vietnam War. Over 20,000 Thunderchief sorties were flown, with 382 aircraft lost (nearly half of the 833 produced) including 62 operational casualties. Although it lacked the agility of the smaller MiG fighters, USAF F-105s demonstrated the effectiveness of guns, and were credited with downing 27.5 enemy aircraft. Although the F-105 weighed 50,000 pounds, the aircraft could exceed the speed of sound at sea level and Mach 2 at high altitude. It could carry up to 14,000 pounds of bombs and missiles. 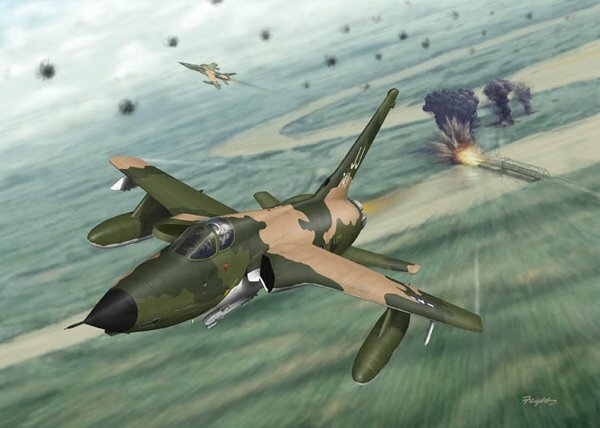 The Thunderchief was later replaced as a strike aircraft over North Vietnam by both the F-4 Phantom and the F-111. During the war, the two-seat F-105F and F-105G Wild Weasel variants became the first dedicated Suppression of Enemy Air Defenses (SEAD) platforms. "Wild Weasel" variants remained in service until 1984, when they were replaced by a specialized F-4G "Wild Weasel V"
Printed on acid-free heavyweight matte paper.